A last-ditch effort by struggling Senate Republicans to dismantle a few key provisions of the Affordable Care Act -- an approach known as "skinny repeal" -- failed in a dramatic fashion early Friday morning, around 1:30 EDT. The 49-51 vote was a major disappointment for the GOP, but a great relief for the state's Democrats. “Health care is a matter of life and death. It affects every person in this country," said Sen. Dianne Feinstein (D-California) in a statement she released less than an hour after the vote. Feinstein lambasted Republicans for their secretive process, which bypassed the usual committees and public hearings. “Their closed process, which shut out doctors, patients, families, hospitals, health plans and advocates, yielded terrible bill after terrible bill," she said. In California, which eagerly embraced the ACA and erected a resilient insurance exchange known as "Covered California," the relief was particularly strong on Friday. Under "skinny repeal," 700,000 fewer Californians would been covered through individual plans sold on the exchange, according to a Covered California statement. An additional 300,000 Californians were expected to drop out of Medi-Cal due to the elimination of the individual mandate. "Covered California and the Medi-Cal expansion are safe for now, and we can feel more secure knowing that our families, friends and employees won’t lose their health insurance," said Jonathan Greer, an independent health insurance broker in Oakland. Greer said watching the prolonged legislative battle in D.C. was agonizing: "It was like watching a good friend or relative suffer in the hospital, not knowing if they would recover." 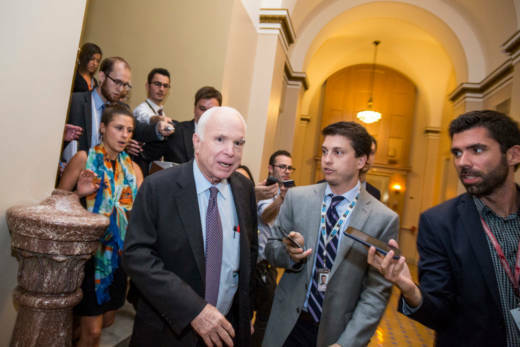 California's Democrats applauded Sen. John McCain's call for a return to bipartisanship after his thumbs-down "no" vote. "I could not agree more, " said congressman Ami Bera (D-Elk Grove). Bera, an internist. He's one of two Democratic doctors in Congress. Earlier this month, Bera pushed an alternate plan to improve the Affordable Care Act, which now has the support of more than 80 House Democrats. "We are ready and willing to come to the table with solutions," Bera said. "I hope to work with my Republican colleagues in the coming weeks to put patients first, cut costs, and increase the number of people insured." Nearly 3.7 million individuals have health coverage through the ACA's Medi-Cal expansion, and more than 1.4 million people are insured through Covered California. California has experienced the largest decline in its uninsured rate in the country -- dropping from 17.2 percent in 2013 to 7.1 percent in 2016. But attempts to undermine the effectiveness of the Affordable Care Act could continue, said Sandra R. Hernández, president and CEO of the California Health Care Foundation. "Danger still lies ahead," she warned. "They will try to make enrollment more difficult, and cut back on public outreach. We especially need to keep a bright light on the budget and appropriations process and on tax reform efforts." Hernández predicts there will also be more attempts to slash funding for Medicaid and other medical safety-net programs. But Rep. Ken Calvert (R-Riverside County) says the status quo is a problem too big to ignore. "Despite political drama in the Senate, we must not lose sight of the fact that Obamacare premiums continue to rise and health insurance providers are dropping out of exchanges across the country." Calvert urged Congress to keep working to provide Americans with the relief they need.